Field Guide to Appropriate Technology is an all-in-one "hands-on guide" for nontechnical and technical people working in less developed communities. It has been developed and designed with a prestigious team of authors, each of whom has worked extensively in developing societies throughout the world. Scientists, community workers, health care professionals, managers and teachers in developing countries. In addition, readers interested in alternative, green, and sustainable lifestyles. 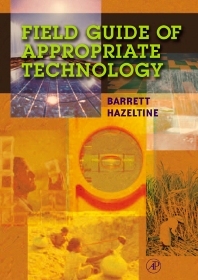 Barrett Hazeltine is a Professor of Engineering at Brown University and a registered professional engineer. He is a renowned educator, having received outstanding teaching awards from thirteen senior classes at Brown. In 1985, the award was named for him. Dr. Hazeltine has a wide array of international experience including teaching positions at the University of Zambia, University of Botswana, and Africa University in Zimbabwe. The development of this book came through a very successful engineering course for non-engineers in Appropriate Technology offered at Brown. Christopher Bull is a Senior Research Engineer and Lecturer at Brown University, with a Sc. B. in Mechanical Engineering and a M.S. in Electrical Engineering. His interests and experience include solar energy systems and devices, and the design and implementation of efficient cook stoves. In addition, he has taught various engineering courses at Brown including the Appropriate Technology course for non-engineers.